Schools in Rhode Island and Providence are suffering from the regular cycle of what Larry Cuban calls "amnesiac policymakers:"
Few policymakers are familiar with the history of urban districts and how they evolved through absorbing waves of earlier immigrants as well as past efforts to improve schooling for the poor. Instead these policy brokers draw from personal experiences while soaking up juicy stories others tell about schools. In ignoring earlier efforts at urban school reform, they either substitute their own pictures of what they think happened or they assume that nothing can be learned from the past because current conditions differ so much from conditions then (or they do both). They err. 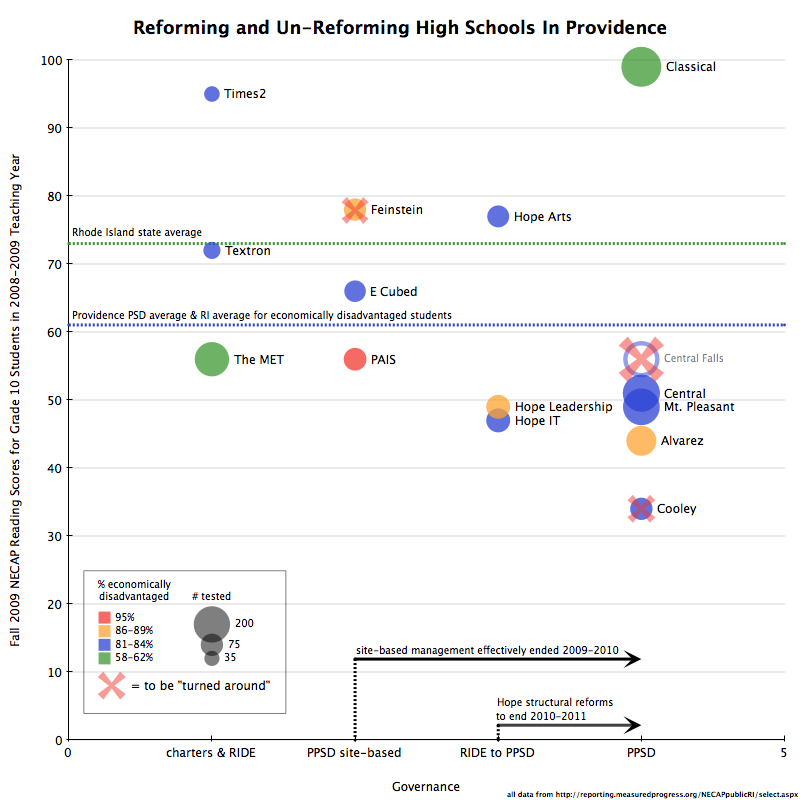 The recent history of high school reform in Providence is particularly complex. As you may have forgotten, just short of 10 years ago Providence was accepting $13,568,880 from the Gates Foundation aimed primarily at creating small high schools. In the past fifteen years or so within the borders of Providence on average about one new high school has opened or been reconstituted each year. From 50,000 feet, it may feel like this has all added up to nothing; certainly Providence has not seen the kind of systemic change it aspired to a decade ago. But there were real successes. Unfortunately, the Brady administration in Providence and Chancellor Gist's RIDE seem more motivated to undo and erase from history the hard-won innovation and achievement in the PPSD's small high schools than sustain it. Feinstein, E-Cubed, and Hope Arts together are the equivalent of pushing a Central or Mount Pleasant's reading achievement over the state average. Or like creating six more successful charters the size of Times2 or Textron. Instead of celebrating these home-grown district schools, they're being dismantled by the state and district, and, in the case of Feinstein, likely closed outright. would you please expand upon the "success" of SLCs in the schools you mentioned? I thought the Gates model was considered a failure -- from what I read but do not remember where. Our district is implementing the SLC model and many of us wonder if this is not just another fad that will be yet another black hole for wasting dollars that could have been better spent. Thanks! The successful SLC's in Providence succeed in the way that other documented cases of successful SLC's are. See Linda Darling-Hammond's work on the subject, for example. 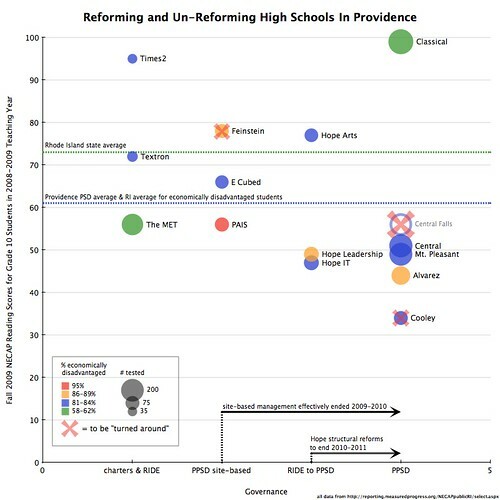 The "Gates model" failed in Providence in the sense that 10 years later, performance in the district as a whole has not been transformed, and the success rate for the small schools in the district is around 50%, with none of the non-selective/open/neighborhood enrollment small schools generating the gaudy stats achievable by even smaller charters. And it has failed in the sense that neither Gates, nor the city, nor the state supports the existing small schools, and since they are small, serve a poor population, and are isolated from each other, they have very little political capacity to sustain themselves. Also, I'd say the main cause of failure for the other 50% of the small schools is the district running out of leadership. You need more principals to run more small schools, and there are only so many to go around. This is a fundamental concern I have about the scalability of the model.